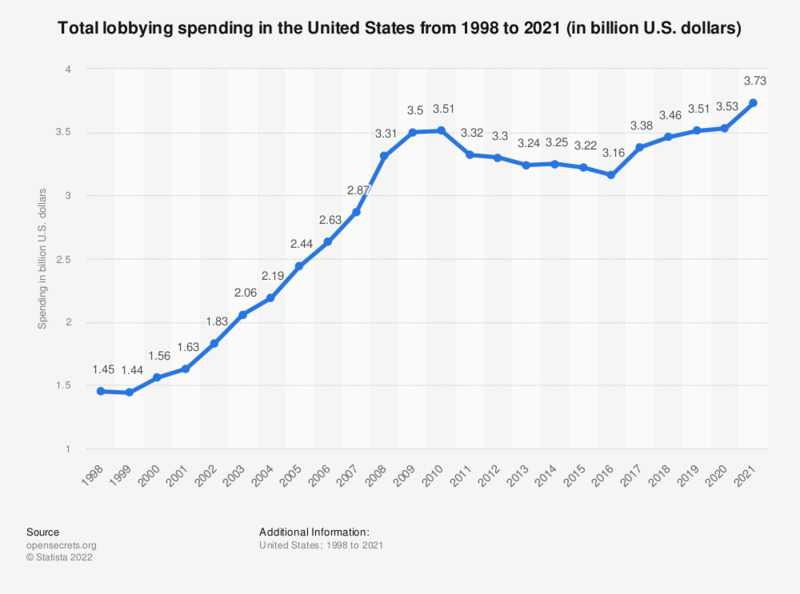 This statistic shows the total lobbying spending in the United States from 1998 to 2018. In 2018, the total lobbying spending amounted to 3.45 billion U.S. dollars. Since the turn of the millennium the amount spent on lobbying in the United States has more than doubled. The intention of firms employing lobbyists, who in turn lobby government officials, is to gain a degree of influence on the legislative process in the hope of legislation more favorable to their business or cause being passed. Lobbying occurs at all levels from local government to presidential elections. The industries utilizing lobbying as a means to gain influence come from a range of industries with the biggest spenders including pharmaceuticals, insurance, business associations as well as oil and gas. The US Chamber of Commerce, a pro business association, was the largest lobbying spender in 2018 by a considerable margin. Lobbying by the National Rifle Association has gained both domestic and global attention. Many observers have pointed to the lobby power of the National Rifle Association when attempting to explain the perceived lack of change in regards to gun control laws. Examples such as the national rifle association, alongside increasing lobbying spending, have lead to increased attention on the lobbying industry and the potential consequences of the industry’s increasing influence. Movements such as the Occupy Movement and protests against free-trade deals with other countries have called for restrictions on lobbying and the asymmetrical power it allows large corporations.